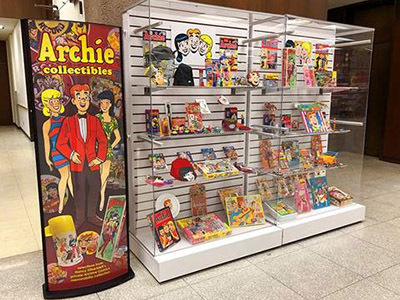 The Syracuse University Libraries Learning Commons is hosting an amazing showcase of Archie Comics memorabilia from the private collection of Archie Comics Co-CEO Nancy Silberkleit on the first floor of Bird Library through May 15. The exhibition is the result of a collaboration of Kate Deibel, Natalie LoRusso, Stephen Singer and Diane Wiener, along with Colleen Theisen from the Special Collections Research Center (SCRC). It is done in partnership with the Center on Human Policy, the Burton Blatt Institute’s Office of Interdisciplinary Programs and Outreach, the Disability Cultural Center and the Disability Student Union. For those interested in comics, the SCRC holds more than 200 collections of comic art, including the Bob Montana Cartoons from the newspaper comic strip version of Archie.